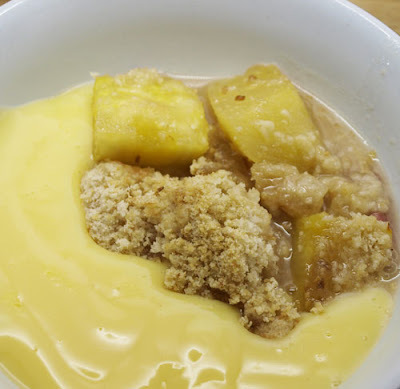 Now this might seem like an unusual combination for a crumble, I have certainly never put pineapple in a crumble before, but Tesco had pineapples reduced price last weekend and I bought one, as you do. Then I didn't use it, so it sat there in the fruit bowl, the outside of the skin drying out and going a funny colour. I really didn't fancy eating it raw and I didn't want to make pineapple upside down cake. 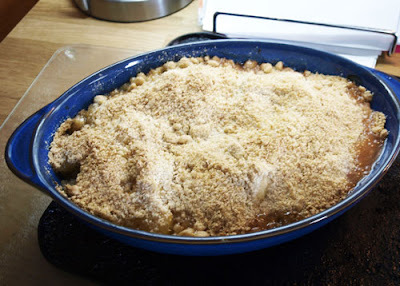 At the same time, the rhubarb in the garden is coming along nicely but still not enough for a full on rhubarb crumble - do you see what happened here? 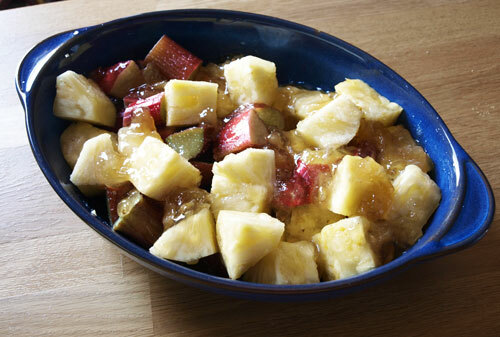 So I cut up the pineapple and cut off any brown looking bits on the outside (the flesh was actually perfectly fine and very juicy) chopped up the rhubarb and put them in the dish with a couple of tablespoons of sugar. 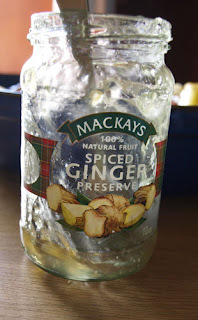 The I wondered what I could flavour the crumble with....ah, at the back of the fridge is half a jar of Ginger Conserve left over from Christmas, I was planning to make Nigella's ginger glazed chipolatas but never got around to it. So I scooped on top of the fruit. 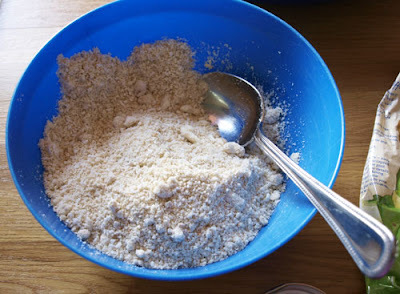 And so to the Crumble, I could tell you that I rubbed the butter into the flour and added sugar, but that would be a lie. 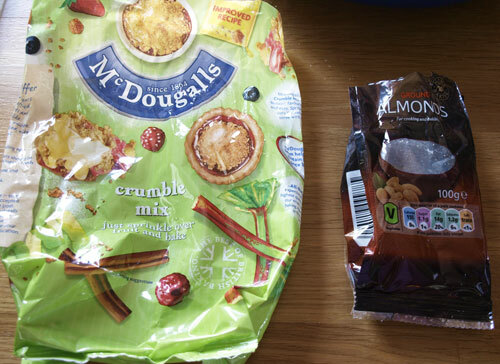 Sometimes I make the crumble myself, but I like to have a bag of McDougalls Crumble Mix in the cupboard for speed. I knew there was about 20g of ground almonds left to, so I threw that in wit the mix and also two tablespoons of the dessicated coconut that I got from those nice people at Healthy Supplies. It all went into the bowl and was mixed through. Into the oven at 180C for about 30 - 40 minutes, you should see the fruit bubbling up round the edges and the crumble should go golden brown. Served with custard, not fancy, egg home-made custard, but made with Birds Custard Powder just like we always had as children! I have to say that the combination was delicious and the pineapple flavour stood up well to being crumbled. Looks great but I'm not too sure its a flavour combo I would enjoy in a crumble. Very exotic though. This is incredibly unique! I have some pear-ginger compote that would go soooo well in this dish! I love pineapple any way you can serve it! We grilled some last night and it was delish! What an unusual combination. Was it good enough to make again do you think? Unfortunately pineapple is about the only fruit I really don't enjoy but have to agree on birds custard - love the stuff!! I do like experimenting too with crumble fillings though and often throw in whatever needs eating up! 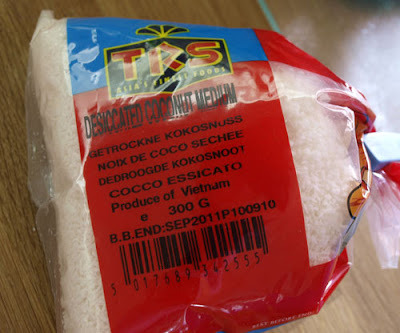 Choclette - yes I would serve it again, but probably with the balance more towards the rhubarb and less pineapple. It was much better than I expected. Crumble and custard is my favourite dessert - whatever the filling. When I was younger we never had custard at home, always ice-cream, so the result is that I now can't resist custard whenever it's available. This sounds like a lovely 'tropical' take on the classic crumble. Anything under crumble is good to me!